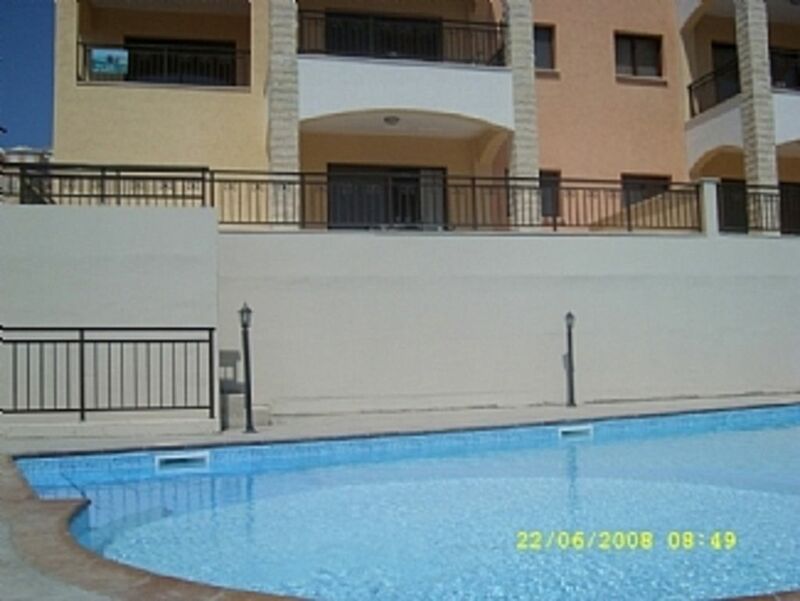 Brand new, modern ground floor apartment with mountain and sea views. Large balcony. Situated in front of one of the 2 pools which includes a small splash pool and disabled access. Includes use of 2 pools, sunbeds, parasol, sauna, changing room/WC and communal BBQ area. Apartment facilities consist of large Fridge/freezer, oven, grill and hob, kettle, toaster, washing machine, bathroom with bath and overhead shower. Television and DVD/CD player, air conditioning/heating units in bedroom and living area, fly screens on all windows. Located 3 mins walk from village square which has all local amenities and a selection of bars and tavernas. 5 mins drive from the blue flag sand and shingle beach in the bay with watersports, shops and restaurants. Aphrodite Hills championship golf course is approx. 20 mins drive away and there are waterparks situated in Paphos and Limassol both 30 mins drive away. Bath with overhead shower, low level WC, sink, vanity unit with storage space, large mirror. Sofa converts to double sofabed, television, DVD/CD player, coffee table, patio doors on to large balcony area. Oven, grill & hob, microwave, large fridge/freezer, kettle, toaster, sandwich toaster, utensils and cutlery, cooking equipment, sink and tap with drinking water tap, dining table and 4 chairs, ironing board and iron (stored in bedroom wardrobe). Skiing available in the Troodos Mountains although this is seasonal, situated approx. 20 mins drive away. Approx. 20 mins drive from Aphrodite Hills Championship standard 18 hole golf course. Notes on accommodation: Wi-fi available (payable locally) Outside: 2 shared pools with sunbeds and parasols, sauna, changing room/WC and shower at pool areas, communal BBQ area with preparation area. Utility Room: Washing machine. Cleaning / Towels / Linen / Maid service: Bath towels provided, you will need to supply your own beach towels. Linen provided for bed and sofa bed. Property is cleaned on departure unless requested otherwise. Other: Outside patio furniture, Outside storage cupboard with clothes airer, sun loungers and parasols. Stayed here for a week at the end of September and what a lovely week we had. Everything we needed was at the property and easy access to the swimming pool (which we had to ourselves for the week)!. Short stroll into the village, about 5-10mins, a bit uphill but nothing strenuous. The village square was lovely, lots of places to eat and drink. If we were to return to Pissouri then we would definitely stay here again. Lee-Ann was also very good with communication. Thank you for your lovely review, we are glad you had a great holiday and the the apartment had everything you needed during your stay. Everything you need for your holiday. Straight out of front into swimming pool. Not too far from the village so can stroll in every evening. Thank you for your review and we are glad you enjoyed your stay. Lovely accommodation, very well equipped. In good order apart from the bedside draw. Fantastic clean pool. Wonderful location, short walk from the village where there were plenty of restaurants. Lots to do in Cyprus. Would go back again. 5 mins drive to local blue flag sand and shingle beach with watersports. 30 mins from beaches in Paphos. Sandy beach in Coral Bay just outside Paphos approx 45 mins drive. Car hire recommended to get out and explore the area. Driving on the left as in the UK. Roads are generally well sign posted. Approx 20 mins drive from Paphos airport or 90 mins from Larnaca airport. 3 mins walk to the local village square which has all local amenities including well stocked supermarket, banks, Internet cafe, and a good selection of bars and tavernas. 5 mins drive to Pissouri Bay with more shops and restaurants, They have Cyprus night in the bay on a friday - great night!! 30 mins drive to Paphos and Limassol both with waterparks. 20 mins drive to the Troodos Mountains. 30 mins to Tombs of the Kings. Local travel agents do excursions to Egypt to visit the pyramids. Booking Notes: 25% initial deposit, balance to be paid in full 6 weeks prior to rental unless otherwise arranged with owner. £50 refundable deposit to cover damage/breakages, will be promptly returned providing there is no damage or breakages in the property. Changeover Day: Flexible, please arrange with owner.